The U.S. would far prefer to see all the oil traffic ended, but the deal had to be the best anyone could hope for considering the foreign ministers of both China and Russia had told South Korea’s Foreign Minister Kang Kyung-Wha they were not going to go for a deal that left North Korea with no oil. No telling exactly how the North would react to a total ban on oil imports, but it would be reckless to think they would see the light, halt their nuclear and missile programs and agree to talk over all the other festering issues between the South and North. The liberal Moon also has to balance the scales between hugely disparate factions at home. In a left/right standoff, rightists, waving Korean and American flags, demand the extremes of a nuclear South Korea, a South Korean military that’s ready to “decapitate” Kim Jong-Un, plus a number of others, and to reunify Korea on South Korean terms. At the other end of the spectrum, leftists and radicals want to bring about the withdrawal of America’s remaining 28,500 troops, close the U.S. bases and do away with the Korean-American alliance. THAAD, the Terminal High Altitude Area Defense counter-missile battery that will probably never launch a missile, makes an easy punching bag, a symbol of the hated [by the Left] U.S.-South Korean relationship. Moon is artfully sticking closely to the historic U.S.-Korea alliance but leaving one thing crystal clear. He is not going to say, sure, go ahead, to any ideas President Trump may have about a preemptive strike on North Korea. It’s fine for B1 bombers to fly up from Guam on mock bombing runs, for the latest F35 Stealth fighters to strafe a make-believe Kim Jong-Un hideout, for Aegis-class destroyers to launch cruise missiles off the east coast, even for South Korean F15’s and ships to join in the fun on land and sea, but that’s as far as it goes. So what happened to the red line that Moon has mentioned? Actually, there is no red line. Or, to be realistic, the North will have to open fire for real to draw the U.S. and South Korea, Japan too, into counterattacking for real. None of that is too likely. 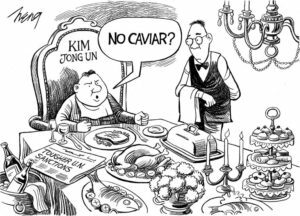 Kim will not be so stupid as to order an attack on a live target, and Trump, whatever he might fantasize, faces constraints that H.R. McMaster, his national security adviser, has presumably made clear to him. North Korea’s expressions of outrage about sanctions, though, do inspire a question. It’s fashionable for professors of certain persuasions to say that sanctions don’t accomplish a thing, that North Korea has no problem evading them and will go on with ever more strident threats ― and tests too. Maybe so, but if sanctions are so ineffective, why does North Korea make such a fuss about them? And if they’re hurting, as their expressions of rage would suggest, have they considered investing the funds they’re wasting on nukes and missiles in more constructive enterprises, like health care, road building and a lot of stuff that every visitor to Pyongyang, however tightly controlled, can clearly see are badly needed? That question gives rise to yet another question. We are all aware of China’s unremitting objections to THAAD, and we’re familiar with the bullying inflicted in revenge on South Korean enterprises in China. The polemics against THAAD in the Chinese media are a lot more scathing than anything they say about North Korea’s nukes. One other thing Moon has made clear. He doesn’t want South Korea to go nuclear. He opposes bringing back the nukes the U.S. withdrew in 1990 to pave the way for the Denuclearization Agreement that South and North Korea signed in 1991 ― the deal that Kim Jong-Il ignored by carrying on the nuclear program more aggressively than ever. Nor does Moon want the South to develop its own nukes. Thank God for that. Japan and Taiwan would then go nuclear, and some nut would order a surprise nuclear strike. No, we don’t need another nuclear power in Northeast Asia.